Bedford Property Blog | 51.8% of Bedford Voters voted to leave the EU – What now for the 27976 Bedford Landlords and Homeowners? 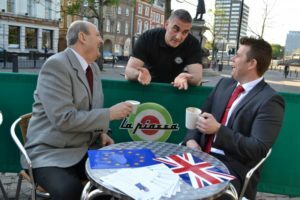 51.8% of Bedford Voters voted to leave the EU – What now for the 27976 Bedford Landlords and Homeowners? … and now the vote has been made … what next for the 20774 Bedford homeowners especially the 10930 of those Bedford homeowners with a mortgage? Bedford property values will probably drop in the coming 12 to 18 months – but by 18% ‐ I am sorry I find that a little pessimistic and believe that figure was rhetoric to get homeowners and landlords to vote in a particular way. But the UK property market is quite a monster. Another Credit Crunch? And so, notwithstanding the Credit Crunch, the worst global economic outlook since the 1930s and the recession it brought us, a matter of a few years later, the Government were panicking in 2012/3/4 that the housing market was a runaway train. … because whilst property values might drop in the country, they will bounce back. It’s only a paper loss.. because it only becomes real if you sell. And if you have to sell, again as most people move up market 2 when they sell, whilst your property might have dropped by 5% or 10%, the one you want to buy would have dropped by the same 5% to 10% .. and here is the best part – (and work your sums out) you would actually be better off because the more expensive property you would be purchasing would have come down in value (in actual pound notes) than the one you are selling. The Bedford landlords of the 4,701 Bedford buy to let landlords have nothing to fear neither, nor do the 11,612 tenants living in their properties. Buy to let is a long term investment. I think there might even be some buy to let bargains in the coming months as some people, irrespective of evidence, panic. Even if we pull up the drawbridge at Dover and immigration stopped today, the British population will still increase at a rate that will exceed the current property building level. Britain is building 139,600 properties a year, but needs according to the eminent ‘Barker Review of Housing Supply Report’, the country needs to build about 50,000 properties a year to even stand still, and as the the birth rate is increasing, the population is living longer and just under a quarter of all UK households now are occupied by a single person demand is only going up whilst supply is stifled. Greater demand than supply equals higher prices. That is definitely a fact. Well, there are many challenges ahead. The country has spoken and we are now in unchartered territory – but we have been through a couple of World Wars, an Oil Crisis, Black Monday, Black Wednesday, 15% interest rates and a Credit Crunch … and we survived! And the value of your Bedford property? It might have a short term wobble… but in the long term ‐it’s safe as houses regardless.